China's Cosco Shipping Technology (CS Tech) has teamed up with Japan's Furuno Electric and Heisei Trading to form a joint venture in the maritime navigation and communications market. 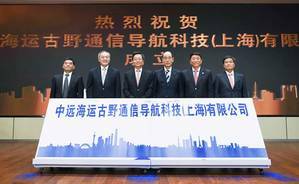 The Shanghai based Cosco Shipping Furuno Navigation Technology will provide equipment, systems and related services for domestic and international shipping fleets as well as inland waterways vessels. The consortium will also examine future research possibilities concerning safer, more secure and efficient ship operation. Yukio Furuno, the CEO of Furuno, said, "The establishment of this joint venture represents the initial step of building up a stronger relationship between COSCO SHIPPING Group and FURUNO, aimed at contributing to the development of the maritime industry, not limited in China and Japan." Furuno said in a press release that it will aim to grow its navigation and communication market and strength brand awareness in China through the joint venture. An opening ceremony for the joint venture was held on September 10 in Shanghai.